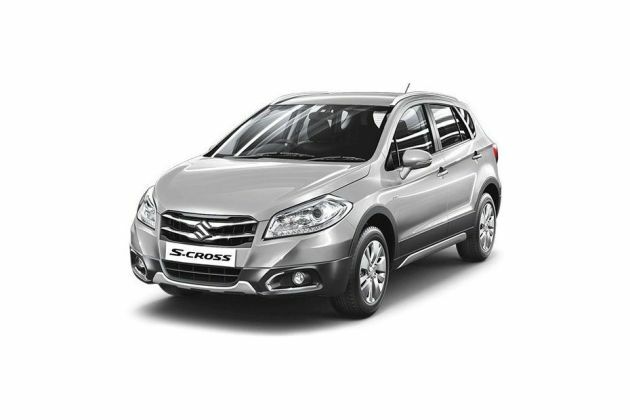 Maruti S Cross is the first premium crossover from this company, which is available in several variants. Of these Maruti S-Cross DDiS 200 Alpha is its top end diesel trim. It comes with a striking internal section that is quite spacious and accommodates five people. It is incorporated with leather upholstered seats, which are foldable in the rear. Right from an illuminated glove box to luggage room accessory socket, the cabin includes almost every useful feature. In terms of comfort, it has cruise control system, keyless entry, driver seat height adjuster, telescopic steering wheel and many more in the list. On the other hand, it has impressive exteriors that can easily lure several buyers. The main attraction in its frontage is the radiant headlight cluster that includes LED positioned lamps. A well sculpted bumper is also available with skid plate beneath it. A modish set of alloy wheels add style to its side profile, whereas its rear end features a windscreen including wiper as well as washer. The firm has offered it with protective aspects like reverse parking camera, anti lock braking system, engine immobilizer, dual horn and various others in the list. This vehicle is powered by a DDiS 200, 1.3-litre diesel motor that is coupled with a 5-speed manual transmission gear box. It a four cylinder engine that delivers 88.5bhp power and 200Nm torque outputs besides giving a healthy mileage. This vehicle comes with a rigid body structure that is further fitted with some remarkable aspects. To begin with its frontage, there is a large headlight cluster that is equipped with HID projector headlamps. It also includes LED position lamps as well as turn indicators. This surrounds a bold radiator grille, which has two horizontal chrome plated slats with company's insignia embossed in its center. The bumper is well sculpted and integrated with a pair of fog lamps and an air dam. Its front fascia also has a wide windshield that is equipped with a couple of rain sensing wipers. Its rear end looks stunning with a stylish boot lid and well sculpted bumper, which has silver garnished skid plate fitted underneath it. The windscreen has a defogger, and wiper along with washer function. The split combination lamps, roof mounted antenna as well as high mount stop lamp are the other aspects in its rear profile. On the sides, there are B-pillars, body colored door handles and outside mirrors with integrated side turn indicators. Also, it has pronounced wheel arches, which are equipped with a set of 16 inch alloy wheels. The radial tyres that cover these rims are of the size 205/60 R16. It has a roomy cabin that is decorated with an attractive color scheme. High quality plastic materials are incorporated inside, whereas a few aspects with chrome finish further gives adds to its elegance. The well designed dashboard houses a tilt adjustable steering wheel, which is wrapped with leather. The center console comes integrated with an air conditioning unit and a music system as well. Coming to its seats, they are well cushioned and covered with fine leather upholstery. The driver's seat is offered with height adjustment facility, whereas the split folding function to the rear one aids in making more space for luggage inside. The first and second row seats both have center armrests with storage compartment at front and cup holder in the rear. Other than these, the cabin also features driver side foot rest, front footwell illumination, front seat back pockets, sunglass holder, and assist grips as well. This trim is equipped with a 1.3-litre diesel engine that has 1248cc displacement capacity. It carries four cylinders that are further fitted with 16 valves. This DOHC valve configuration based motor is integrated with a common rail fuel injection system and mated with a five speed manual transmission gear box. It can return a maximum mileage of around 23.65 Kmpl on the highways and under traffic conditions, it comes down to nearly 18 to 19 Kmpl. This mill with a variable geometry turbocharger produces a peak power of 88.5bhp at 4000rpm besides delivering torque of 200Nm at 1750rpm. Moreover, this DDis motor is compliant with Bharat Stage IV standard emission norms. This vehicle's handling is best ensured through its steering wheel that is tilt and telescopic adjustable. It assists the driver to maneuver it easily irrespective of road conditions. It comes with a reliable braking system wherein, its front wheels are fitted with ventilated disc brakes and the rear ones are equipped with solid disc brakes. It is further accompanied by anti lock braking system that further boosts this mechanism. Meanwhile, its suspension system comprise of a McPherson strut on its front axle and a torsion beam on the rear one. These both are further loaded with coil springs that helps in dealing with jerks caused on uneven roads. The car maker has bestowed it with a number of comfort aspects that guarantee an enjoyable driving experience to its occupants. It has a TFT information display that comes along with a trip meter and provides updates of fuel consumption and outside temperature as well. An advanced smartplay audio unit offers the best in-car entertainment. It includes a navigation system and supports Aux-In as well as Bluetooth connectivity. Also, it comes with two tweeters and four speakers that gives best sound output. There are front sunvisors with vanity mirror lamps, while the power windows have auto up and down function on the driver's side. It has accessory sockets in the front cabin and in luggage room for added convenience. Other aspects like cup and bottle holders, electrically adjustable ORVMs, automatic air conditioning unit, electric back door opener and many others further enhance the comfort levels. This trim is loaded with a number of security features that assures maximum protection. Some of these include reverse parking camera, TECT body structure, seat belts with front pretensioner and force limiter, anti lock braking system and dual front airbags. In addition to these, it also has reverse parking sensor with display, central locking system, engine immobilizer, anti theft security system and rear demister that adds to the safety quotient. 1. Numerous protective features are offered. 2. Engine performance is rather good. 1. Interior styling can be further improved. 2. A few more aspects can be added.